Sjögren's (pronounced SHOW-grins) syndrome is a chronic autoimmune inflammatory disease in which moisture-producing glands are damaged, significantly decreasing the quantity and quality of saliva and tears. The disease was first identified by a Swedish physician, Henrik Sjögren, in 1933. Although the hallmark symptoms are dry eyes, dry mouth, fatigue and joint pain, Sjögren's may cause dysfunction of other organs, affecting the kidneys, gastrointestinal system, blood vessels, lungs, liver, pancreas, and the nervous system. Patients also have a higher risk of developing lymphoma. Sjögren's is one of the most prevalent autoimmune disorders, striking as many as 4,000,000 Americans. Nine out of ten patients are women. About half of the time Sjögren's occurs alone, and the other half it occurs in the presence of another connective tissue disease such as rheumatoid arthritis, lupus, or scleroderma. All instances of Sjögren's syndrome are systemic, affecting the entire body. Symptoms may plateau, worsen, or uncommonly, go into remission. While some people experience mild discomfort, others suffer debilitating symptoms that greatly impair their functioning. Early diagnosis and proper treatment are important -- they may prevent serious complications and greatly improve a patient's quality of life. 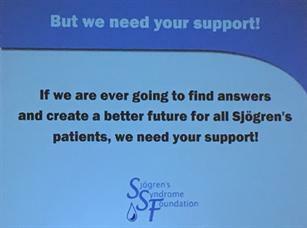 For more information on Sjögren's syndrome please visit the Sjögren's Syndrome Foundation website.